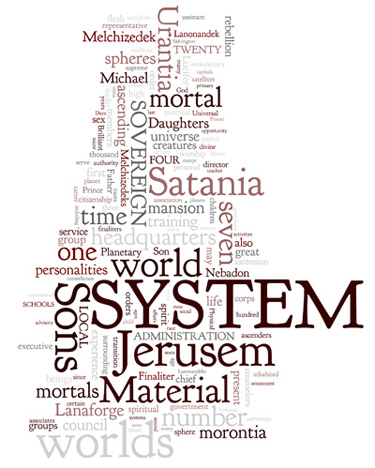 45:0.1 THE ADMINISTRATIVE CENTER of Satania consists of a cluster of architectural spheres, fifty-seven in number—Jerusem itself, the seven major satellites, and the forty-nine subsatellites. Jerusem, the system capital, is almost one hundred times the size of Urantia, although its gravity is a trifle less. Jerusem’s major satellites are the seven transition worlds, each of which is about ten times as large as Urantia, while the seven subsatellites of these transition spheres are just about the size of Urantia. 45:1.2Number 1. The Finaliter World. This is the headquarters of the finaliter corps of the local system and is surrounded by the receiving worlds, the seven mansion worlds, dedicated so fully to the scheme of mortal ascension. The finaliter world is accessible to the inhabitants of all seven mansion worlds. Transport seraphim carry ascending personalities back and forth on these pilgrimages, which are designed to cultivate their faith in the ultimate destiny of transition mortals. Although the finaliters and their structures are not ordinarily perceptible to morontia vision, you will be more than thrilled, from time to time, when the energy transformers and the Morontia Power Supervisors enable you momentarily to glimpse these high spirit personalities who have actually completed the Paradise ascension, and who have returned to the very worlds where you are beginning this long journey, as the pledge of assurance that you may and can complete the stupendous undertaking. All mansion world sojourners go to the finaliter sphere at least once a year for these assemblies of finaliter visualization. 45:1.3Number 2. The Morontia World. This planet is the headquarters of the supervisors of morontia life and is surrounded by the seven spheres whereon the morontia chiefs train their associates and helpers, both morontia beings and ascending mortals. 45:1.5Number 3. The Angelic World. This is the headquarters of all the seraphic hosts engaged in system activities and is surrounded by the seven worlds of angelic training and instruction. These are the seraphic social spheres. 45:1.6Number 4. The Superangel World. This sphere is the Satania home of the Brilliant Evening Stars and a vast concourse of co-ordinate and near-co-ordinate beings. The seven satellites of this world are assigned to the seven major groups of these unnamed celestial beings. 45:1.7Number 5. The World of the Sons. This planet is the headquarters of the divine Sons of all orders, including the creature-trinitized sons. The surrounding seven worlds are devoted to certain individual groupings of these divinely related sons. 45:1.8Number 6. The World of the Spirit. This sphere serves as the system rendezvous of the high personalities of the Infinite Spirit. Its seven surrounding satellites are assigned to individual groups of these diverse orders. But on transition world number six there is no representation of the Spirit, neither is such a presence to be observed on the system capitals; the Divine Minister of Salvington is everywhere in Nebadon. 45:1.9Number 7. The World of the Father. This is the silent sphere of the system. No group of beings is domiciled on it. The great temple of light occupies a central place, but no one can be discerned therein. All beings of all the system worlds are welcomed as worshipers.